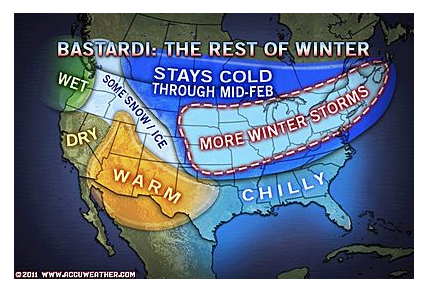 Joe Bastardi, AccuWeather's ace long-range forecaster, has released his outlook for the rest of the winter. The south has been very cold, snow fall across a large portion of the south is well above normal, with prospects for more snow in the coming days (and probably weeks) as we are locked into a strongly negative AO and positive PNA (as is reflected in the latest forecast graphics from Mr. Bastardi). You rail about climate scientists making long range forecasts and tout the fact that we struggle with the short-term. (Several recent posts illustrate that fact, especially the post sparking our previous discussion and one from earlier today (22 January). So why now are you advocating someone's seasonal forecast? Especially when his original forecast was incorrect. This is a fair comment and I welcome it. I'll answer in two parts..
BASTARDI. I have seen some rather amazing forecasts from Joe verify, even some that were completely different than the NWS's. You are correct that his initial 2010-11 winter forecast was way off. While I believe Joe is a better than average long range forecaster, I do not believe that he has a great deal of "skill" as defined in meteorology. CLIMATE FORECASTS. I have not seen Joe attempt to make forecasts more than six months out. As mentioned above, there isn't a great deal of skill there. Logically, if we cannot make consistent forecasts at six months, there is no reason to believe we can do so at 60 years. But, go back to the 2004 IPCC report. They issued a forecast out to 2100 with 95% error bars. Much of the time since that report was issued, temperatures are outside the confidence interval on the low side. But, if we look at the high-profile climate forecasts (west side of Manhattan under water by 2000, no more snow for UK, etc., etc. ), they have been spectacular failures. To me, this is sufficient to nullify the hypothesis that we can forecast the climate decades in advance.